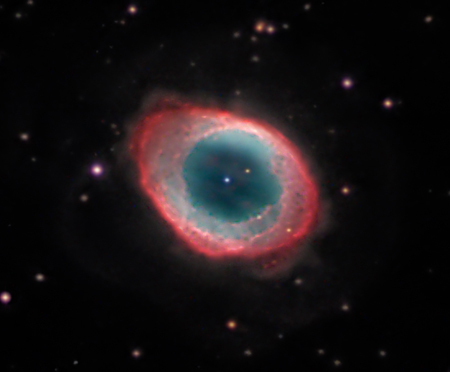 This is probably the most famous planetary nebula there is, and was the first DSO I imaged, in October 2006. A planetary nebula is what happens late in the life of a star like the sun, when it sheds its outer atmosphere, leaving a hot white dwarf star about the size of the earth in the centre. It's not hard to image, as it's very bright, but getting fine detail is much harder, as it is very small. It is 2300 light years away from us, in the constellation of Lyra. 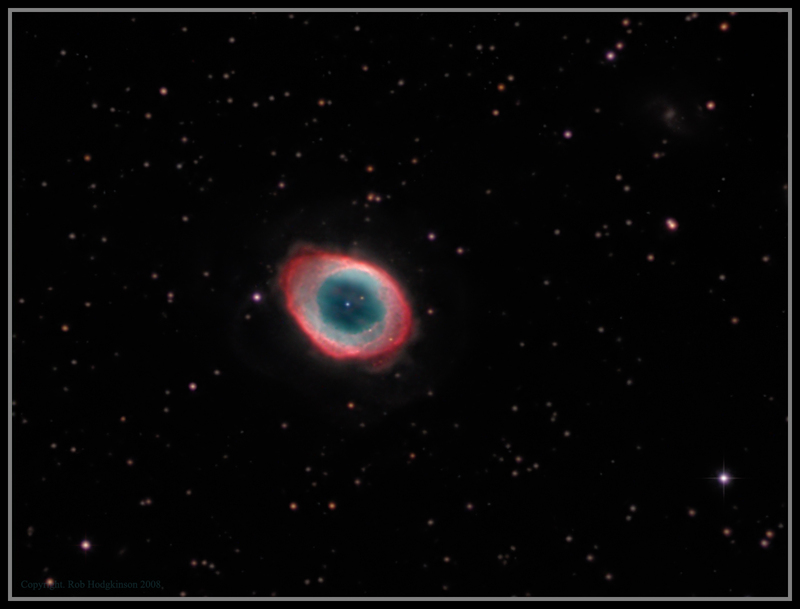 Imaged with a 14inch LX200GPS at F10, Atik 16HR and Astronomik filters. I added some Ha data that I'd gathered in June 2008 which was originally done as a test to try to capture the outer halo and have used this solely for the halo and some detail in the ring itself. This was added as an extra luminance layer and faded as it was very noisy. Luminance captured on the 10th October, Ha on the 10th June. H-alpha was about 20 x 10 minutes at F6.3 binned 2x2 for increased sensitivity and then resized in maxim to match the October data.